Apple Streusel Coffee cake combines tender crisp apples, slivered almonds, and buttery crumb toppings in a perfect easy to bake dessert. Preheat oven to 350 F and lightly grease a 7-inch square cake pan. Mix all the ingredients for the base in a large mixing bowl. Incorporate well. Spoon batter into the greased baking pan and press it down using a spoon until all the batter is evenly distributed across the surface. Arrange the apple slices over the dough in three rows, with the apples slightly overlapping. Sprinkle the cinnamon and nutmeg then top with the slivered almonds. To make the streusel, combine all the ingredients in a small bowl until the mixture resembles breadcrumbs. 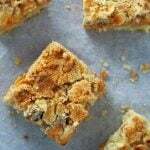 Sprinkle streusel on top of the cake and bake for 1 hour or more, until lightly golden.